Virtual Local Area Networks (VLANs) use tag-based LAN multiplexing technology to simulate multiple LAN’s within a single physical LAN using IP header tagging. VLAN ID/tags are 4-byte frame extensions that contain a VLAN identifier as well as other information. VLANs multiply the capabilities of WiJungle appliance. VLAN tags added to network frames increases the number of network interfaces (ports) beyond the available physical ports on the WiJungle appliance. To configure VLAN, it is must that an administrator should have read-write permission of LAN settings in Network section. Go to Network Section > LAN Interfaces and click on Add VLAN. Below pop-up box will open. Fill in the parameters as described in table to configure VLAN. Select Interface Select the physical interface on which the VLAN has to be configured. Serving Location Enter the location this VLAN would serve in a network. For ex. in case of education institutes, it could be library etc. IP Enter the start IP address of the range, looking to distribute on this interface. Subnet Mask Choose suitable subnet mask to define the no. of IPs in the network of VLAN interface. Gateway IP Enter any of the IP from the range as Interface IP. Default Lease Time Set the default time period for which an IP address should be leased to a device by DHCP Server. Maximum Lease Time Its the maximum time period for which an IP address lease can be granted to a device. Conflict Detection If enabled, then system pings and checks whether any of the IP address from the range is set as static on any of the host to avoid IP conflict. Interface Bypass Bypass infers that no authentication would be asked on this interface. Direct internet access would be given to connected device users. Interface Policy Refers that specific bandwidth and filtering policy can be applied to the interface. 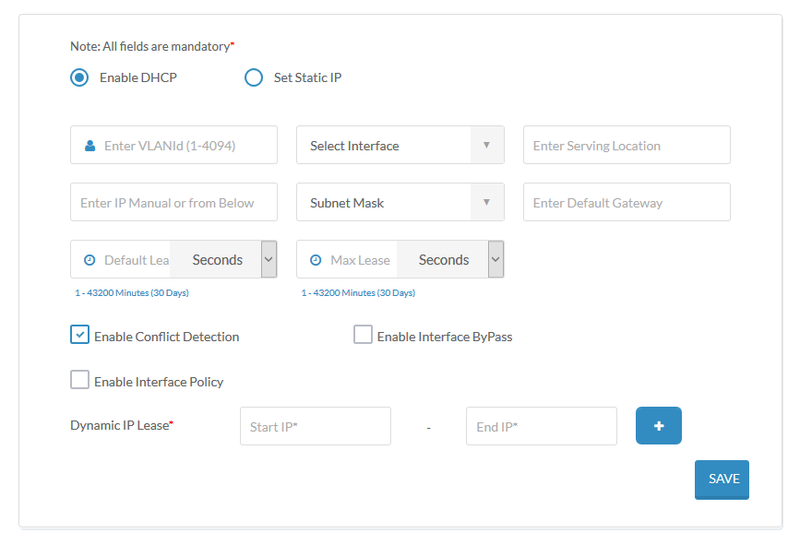 Dynamic IP Lease To specify the IP ranges that DHCP server should distribute to the device users. Once entered the values, click on save to create VLAN.